Click here for more information on how our CSA works. 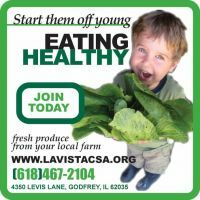 If you have not yet done so, please join our mailing list on the right hand side of the home page at www.lavistacsa.org to be sure you receive important information about your share. Please mark your calendars for the following pickup dates. "Full" shareholders pick up their full shares every week. "Half" shareholders pick up a half share every week. "Alternate" shareholders pick up their shares every other week. The weeks are assigned at the beginning of the season. It is important to only pick up on designated days, since harvesting is based on the number of shareholders picking up. A friend or family member may also pick up for you. *Pickups at Garden Heights are only from 7am to 9am. If you cannot make it, please have someone else pick up for you. We are unable to leave boxes of produce for shareholders at Garden Heights Nursery. If you cannot pick up or make arrangements for someone else to pick up for you by 9am, your produce will be donated to the Crisis Food Center. Shares not picked up will be donated to the Crisis Food Center. 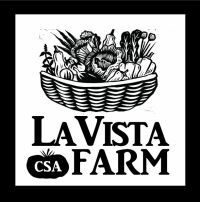 All content property of La Vista CSA Farm. 4350 Levis Lane, Godfrey, IL 62035.